The drought of 2016/2017 hit very hard here in Kruger National Park, as it did in most of South Africa. Our rainy season usually starts in October or November, but in 2016, we had no rain to speak of in the last three months of the year. The beginning of 2017 we had a little bit but not nearly enough to fill pans let alone the dams all around. The Letaba and the Olifants Rivers had slowed down to a little trickle, making us wonder if they were going to stop flowing altogether. The bush was looking incredibly dry. There were areas, especially north of Satara, with not a single blade of grass between the dry scrubs, and dust devils swirling the dry soil around like little tornados on the horizon. Around Letaba all the Mopani trees had lost their leaves. There was so little grazing and browsing; the animals were really struggling. Except for the predators and the scavengers. They were looking fat and happy.We were starting to wonder if this drought would ever end! We have had water restrictions in place for as long as I can remember, only being allowed to water our grass on Tuesdays, Thursdays and on weekends early mornings and late afternoons. We would try water as little as possible. Just enough to keep the grass going that we struggled so much to get to grow in the first place. But even then, our gardens probably looked about a hundred times more appealing to all the animals around the staff village than the bone-dry bush around us. The fence around our garden was pretty much non-existent after elephants had walked through it a few times. (read A naughty overnight visitor and The day in snowed in the staff village) We woke up one night by the sound of branches breaking right by our bedroom window. An elephant was munching on the magic guarri that is at the window. We could see him clearly in the moonlight. The movement of the curtains probably spooked him. He took one last mouthful and retreated back into the bush after carefully stepping over the broken fence. We would wake up some mornings with a herd of impala eating our grass or bushbuck munching on the bushes next to the fence. We didn’t mind it, we felt so sorry for all of them… this drought was taking its toll. The elephants, which up until then would only come into the yards at night, were getting more desperate and bold and we started to see them more and more during the day. I counted about 6 different bulls that we would see regularly; one of them had stunning tusks. One morning I was busy feeding Jack in our bedroom, when Alex walked in and said “mama kom, olifant!” – mommy come, elephant! I walked into the living room and looked through the window. There was an elephant standing on the grass in the middle of our neighbour’s garden! He had his back towards us and was busy feeding on the stunning, but now not so stunning, aloes. We watched quietly as the ellie destroyed aloe after aloe. And when those were well and truly finished he then made his way around the back of the house and across the fence into another yard with a beautiful (and delicious looking) fig tree. He carefully lifted each leg high enough not to touch any of the chicken mesh or wires. It was quite funny to see. Almost like he thought the people would get upset with him if he damaged the already downed fence. Maybe he actually did. Elephants are very intelligent. You never know! Naughty ellie! Pick up that broom and clean up after yourself! I snuck around the back and crept up to our other neighbour’s house. 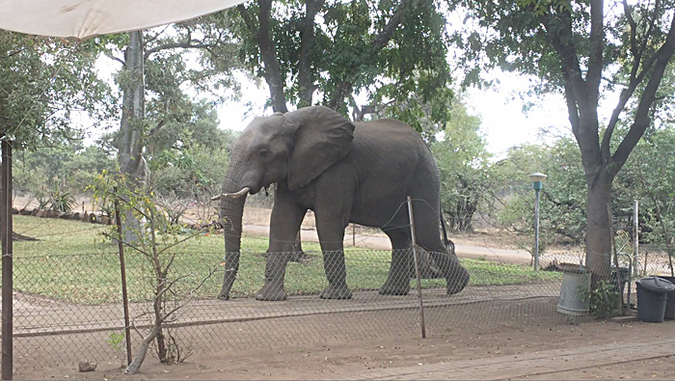 They were not home, but I am sure they would love to see some pictures of this elephant standing next to their washing line, eating away at the fig tree at the back of their house. The lady that helped clean their house let me in. She was absolutely petrified!! She was worried the elephant was going to attack her inside the house… “An elephant will never do anything like that!” I tried to reassure her, but she still looked very worried. I watched the elephant from their bedroom and took a few photos and video’s through their open bathroom window. The elephant did not have a care in the world. He was eating his fig tree contently, flapping his ears in the heat of the day and occasionally throwing some dust over his back. This particular bull had a half broken right tusk and a notch in his ear so I recognised him when he came back the next day. And the day after that. I called him naughty boy. Because, boy was he naughty!! We would see him almost every other day for the next couple of weeks. He would make his way up our neighbour’s driveway, around the back of her house. Then carefully step over the fence and have a few more juicy fig tree branches. One time he brought a couple of his buddies, but they were not so sure about trespassing into the people’s territory. They would hang around the open gate, nervously swinging a front leg back and forth or fiddle with a rock or a twig with their trunk, waiting for their brave friend to come back. It was all very entertaining to watch! We loved having these gentle giants so close to the house! It is one of the reasons why living here in Kruger is so amazing! Especially our staff village in Letaba, which is located a few kilometres away from the main rest camp is so very special. There was a time though when the group of 6 hooligans got a bit out of hand and walked through fence after fence. That is when they got chased away by the helicopter. And when the rains finally came and the drought ended, there was no need for them to come into the gardens anymore. I haven’t seen naughty boy in a while, but the elephant with the nice tusks, I am sure it was him that paid our garden a visit the other night! Maybe naughty boy showed him a trick or two! Thanks for this lovely story Linda. I enjoyed the way you were quite happy to share your garden food with the elephants even though its not easy to maintain a garden in Kruger. I find that elephants, unless someone enters their personal space and thereby becomes a threat, or interferes with their communication, are generally most well-mannered and tolerant so I smiled when I read your lovely description of the way the elephant was so careful and respectful of the fences. Hi Sal! It really is quite the challenge to get a garden going! And we will have to start from scratch once we move into the new house at Malelane gate!! I love Elephants, 2nd favourite I think, after Spotted Hyenas, but how can you ever choose. Lovely story. I would love to do a short interview with you for my blog. If you are interested, please will you send me your e-mail address to countrylivingsablog@gmail.com, so I can mail you the questions. Skukuza staff village is WILD!! Must have been quite scary! Ah thanks Marian! And also for taking the time to read them! I absolutely love your blog. Thank you. My husband and I are Kruger fanatics. It must be so awesome to live there full time. Glad you enjoy it Carla! Yes it is great to live here, challenging sometimes with small kids, but an amazing experience! So glad I found your blog. Lived the Naughty Boy story. Thanks you Beth! Glad you like it and thanks for signing up! Lovely story about ellies Linda. I always wished to stay and work in Kruger. Since we share the same name, can we swop jobs time to time? LOL… Enjoy! Thank you, Linda! I am actually looking for work. Hoping Malelane has a nice position for me some somewhere!